The Internet has fallen in love with the dad who jumped on stage to help his daughter complete her recital performance after she was struck with stage fright. His new title is "Daderina." The internet was so won over by the dad who rescued his frightened little ballerina daughter from stage they gave him an official title. If you haven't seen this ADORABLE video then stop what you're doing right now and watch. Dad Marc Daniels, a father of three in Bermuda, charmed the internet when he hopped on stage during his daughter's dance recital after she began to cry, according to the Washington Post. He takes his daughter's hand and in khaki shorts and bright red tennis shoes, begins to do his best twirls and pliés — with a baby in his arms, no less. 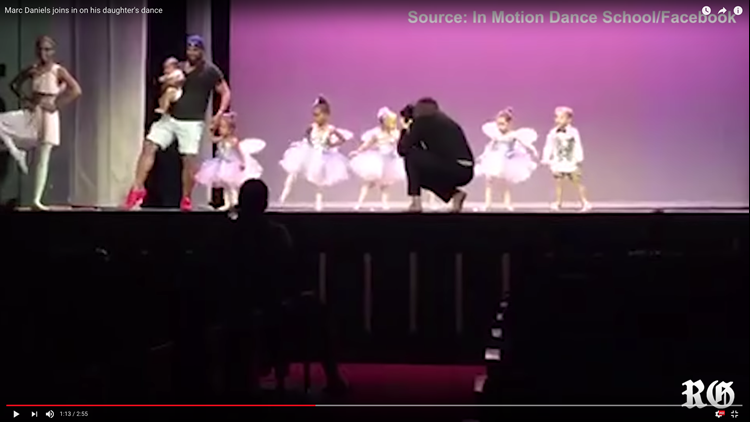 The audience applauds and hoots and the viral video taken by a parent has been viewed millions of times on YouTube from multiple postings. Initially, Daniels thought his daughter Bella, 2-1/2, only needed a quick hug. He said later that he didn't want his daughter to be the only child who had to to come off stage so he joined her. It didn't take long for Daniels, who was filmed during that dance dress rehearsal recital at the end of May, to go from being a hero to his daughter to his own hashtag. #Daderina fans were impressed with the muscular man's moves. They were touched by his tenderness. The final ballet performance was in June and dad said his daughter Bella did great with no assistance.